Info "AAAUUGH! I’M FAAAAAAAAAALLING! SAAAAAVE MEEEEEEEEEEE!" Honeymoon Fall Out is a Microgame found in WarioWare: Smooth Moves. It is a pun on the word "fallout," which refers to a big fight that spells the end of a friendship. It is in Mona's stage. In this game, the player has to rescue a falling and screaming damsel in distress from the dangers below her. The player must reach out with the Wii Remote to grab her hand and prevent her from falling the rest of the way down. If the player is able to do this in the allotted time, the game continues. If not, the player may lose a life. In harder levels, the girl's hands wave around. 1st level difficulty: The girl is falling off a skyscraper and her hand is still. 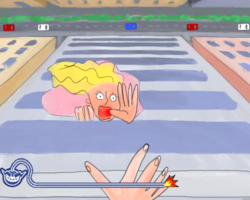 2nd level difficulty: The girl is falling into a pit of crocodiles and her hand is waving around mildy. 3rd level difficulty: The girl is falling off an airplane and her hands are waving around erratically. This page was last edited on February 19, 2018, at 17:08.